Donald Trump Hosts Rudy Giuliani, Chris Christie And Kris Kobach, Among Other Possible Cabinet Picks : The Two-Way Potential appointments dropped by Donald Trump's New Jersey golf course Sunday, but the only concrete news came from New York: His wife and son will not move to the White House with him right away. 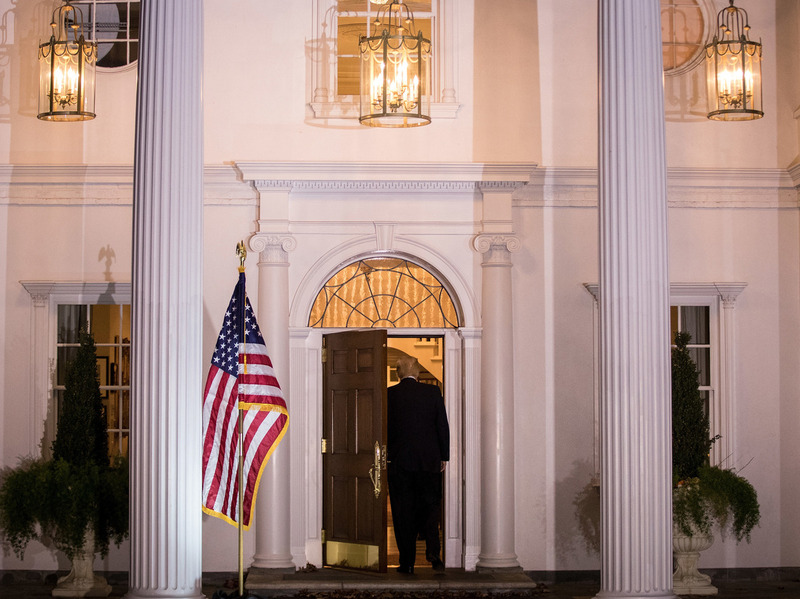 President-elect Donald Trump heads inside the clubhouse following his meeting with David McCormick, president of the management committee at Bridgewater Associates, at Trump International Golf Club in Bedminster Township, N.J. Rarely has a single door attracted so much media attention. All weekend, cameras have been trained on the wood-paneled door of the clubhouse at the Trump International Golf Club in Bedminster Township, N.J., as the journalists behind them sought to suss out clues to the next step in President-elect Donald Trump's transition efforts. And on Sunday, those clues trickled in with each new arrival. Among the visitors Trump received at the clubhouse Sunday were New Jersey Gov. Chris Christie, former New York City Mayor Rudolph Giuliani and Kansas Secretary of State Kris Kobach. CNN reports Trump also met with Wilbur Ross, billionaire investor and chairman of WL Ross & Co. — and now, a leading candidate for the position of commerce secretary, according to CNN. The crammed slate of meetings follows a Saturday that saw visits from Mitt Romney — an erstwhile critic of Trump now in consideration for secretary of state — and retired Marine Corps Gen. James Mattis, who is believed to be a possible pick for secretary of defense. Retired Army Gen. Jack Keane told NPR's Rachel Martin that Trump had already asked him to head up the Department of Defense, but that he had declined due to "personal issues surrounding the death of my wife recently." Keane said that he suggested Mattis and former CIA Director David Petraeus to Trump as alternatives. For his part Trump has repeatedly praised Mattis this weekend, including a laudatory tweet Sunday that called him "a true General's General!" "Mattis oversaw U.S. forces in the Middle East from 2010 to 2013. He was said to have consistently pushed the military to punish Iran and its allies, including calling for more covert actions to capture and kill Iranian operatives and interdictions of Iranian warships. "Former defense officials said Mattis's views on Iran caused him to fall out of favor with the Obama administration, which was negotiating the Iranian nuclear deal at the time. Mattis, who also clashed with the administration over its response to the Arab Spring and how many troops to keep in Iraq, was forced to retire earlier than expected to clear room for his replacement at U.S. Central Command." Yet on Sunday evening, it was another retired general who stood beside Trump outside that clubhouse door: Marine Corps Gen. John Kelly, the former head of U.S. Southern Command. While standing with Kelly, Trump was asked about his transition meetings — to which he replied: "We've made a couple of deals." To this point, Trump has announced his picks for five key positions in his incoming administration. Here is NPR's running tally of his appointments so far. Still, there was some other news of the president-elect's transition that did not revolve around that door in New Jersey. Trump confirmed to reporters that his wife, Melania, and 10-year-old son Barron would not be moving into the White House with him, at least at first. He said Melania and Barron would join him in Washington, D.C., "very soon — right after he finishes school." The New York Post reports the two will continue to live in Trump Tower in New York City so that Barron can continue to attend his current private school. "No official statement has been released by the Trump family regarding transition timing, but like any parents they are concerned about pulling their 10-year-old son out of school in the middle of the year," said transition spokesman Jason Miller. "We would also appreciate the same privacy and security considerations given to previous First Families with regard to minor children be extended to the Trumps as well."